Three adjectives are often used to describe Larry David, the star and creator of Curb Your Enthusiasm, which recently premiered its eighth season after two excruciating Curb-less years. 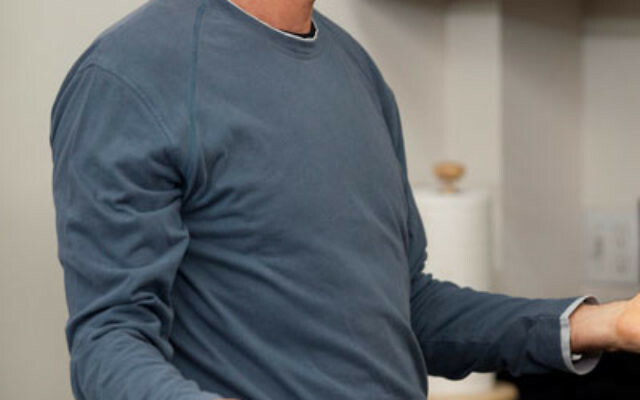 “Larry David plays himself as a bald, bespectacled neurotic,” The New York Times wrote in a review of the new season. “Larry David plays a neurotic fussbudget named Larry David,” The Washington Post said in 2010. “He’s officially an L.A. neurotic,” the New York Post recently bemoaned. I can’t speak to the inner tumult of the real Larry David, the writer and actor behind the bald, bespectacled mask. I’ve never met the man. (If I ever did, we either would circle each other silently in a moonlit forest clearing before gently pressing our foreheads together like unicorns performing a mating rite, or within five minutes each lie dead by the other’s hand.) Yet by any measure — and certainly compared to his Jewish comedic contemporaries — Larry David is a character remarkably free of internal conflict. Psychoanalytic theory holds that neurosis occurs when the different parts of the personality are at war with each other. Now think of Larry David: He has no internal conflicts; he’s difficult, but he’s content. Not for him the unrelenting angst of Albert Brooks or the comically tattered sense of self-esteem of Richard Lewis (a frequent Curb guest star). As for the Grand Emperor of Neurotics, Woody Allen (and David’s director in the 2009 film Whatever Works), the two men’s public personas could hardly be more different. Apart from the glasses, the Brooklyn accent, and their Jewishness, David is, in effect, the anti-Allen. David is no romantic; he wouldn’t have lasted five minutes with a whimsical naive like Annie Hall. In the first episode of Curb’s latest season, David’s divorce from Cheryl is finalized. First, though, there is a possibility of reconciliation, which David characteristically bungles. Cheryl leaves and then David just cuts to his divorce lawyer one year later. One can imagine Allen commemorating this event with a sentimental montage of happier times; Larry is more concerned with Dodgers tickets and whether his divorce lawyer is lying to him about being Jewish. Their relationships with technology are at odds as well. Compare Allen’s famous war with machines to Larry’s primal rage at vacuum packaging. Allen blames himself for his difficulties. With Larry, it’s the package’s fault. For David, the conflict is always external, and this lack of introspection characterizes virtually all of his interpersonal actions. When David refuses to add an additional tip for the servers at the country club, the problem isn’t his parsimony, it’s the server’s greed. He feels similarly in the right when he tries to rescind his order for Girl Scout cookies or screams at the neighborhood kids for serving him subpar lemonade. Why should he allow himself to be taken advantage of? As far as Larry is concerned, his only problem is the unreasonableness of others. He might come off like kind of a jerk, but that’s your problem, not his. He’s a self-actualized jerk. It’s tempting to ascribe David’s blind unconcern for the feelings and good opinion of others on his immense fortune, which is alluded to, if rarely explicitly stated — if I had half a billion dollars, I probably wouldn’t care what anyone thought of me either. 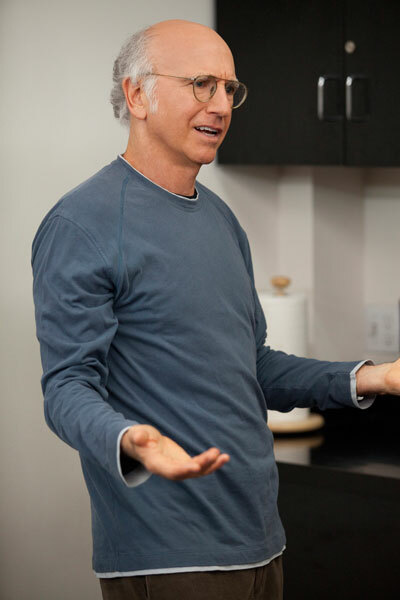 But Larry seems utterly unimpressed by the trappings of wealth — he still buys his pants at Banana Republic, for God’s sake — and as such, I propose his bizarre self-confidence comes from another, deeper source: Virtually alone among his peers, Larry David has absolutely no ambivalence about being a Jew. From his disgust at Cheryl’s enormous Christmas tree, to the glee with which he hangs a mezuza with his father-in-law’s special Christ Nail, to his inadvertent rescue of a Jewish man from a mildly coerced baptism, David’s outlook is essentially tribal. To him, a Jew trying to pass as a gentile is as ridiculous as a bald man in a toupee. David’s comic pose is less that of the anxious assimilationist eager to fit in than that of the clueless greenhorn making his way in a world to which he’s not sure he cares to belong. Or perhaps he’s even more atavistic than that. Neurosis is often defined as a focus on behavioral minutiae that can border on the obsessive-compulsive, but Larry’s many preoccupations, from the unwritten laws of dry cleaning, to the proper way to treat chauffeurs, gardeners, and other laborers, to the irrevocable uncleanness of certain objects (pens that have seen the inside of Jason Alexander’s ears, $50 bills laced with Funkhauser’s foot sweat) recall another endless litany of unbending edicts: the Book of Leviticus. Larry David isn’t a neurotic; he’s just demanding. Like the God of the Hebrews. He can be kind of a jerk, too. This was reprinted from Tabletmag.com, a new read on Jewish life.